This is what happens when headline writers cram poorly constructed puns down readers’ throats. In Kyle Weiland’s major league debut on Sunday, he was tossed from the ballgame in the fourth inning. Other strange things happened as well – a veritable salad of events, including a home run from Marco Scutaro. The whole of the game itself could be considered the lettuce while numerous ejections of players and managers on both sides served as the proverbial tomatoes, onions, cucumbers and sliced carrot. 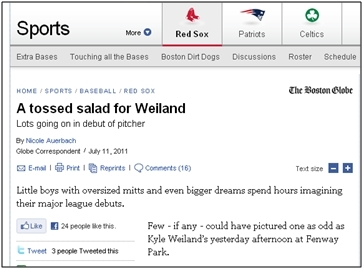 Thus, the Boston Globe’s online story two days later headlined A Tossed salad for Weiland, was hastily changed to the less suggestive – albeit as perverse on a grammatical level – Lot’s going on in Kyle Weiland’s debut. There is probably a pretty good joke that could be made here, especially in light of the fact that the gaffe came on the same day the site devoted an entire article to an interview with a Fenway Park hot dog vendor. But unplanting our tongues from our cheeks for a little while suddenly doesn’t sound like such a bad idea. To be completely Ernest, the whole thing has left a bad taste in everyone’s mouth. 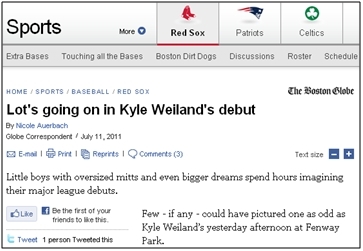 This entry was posted in Red Sox, The Boston Globe. Bookmark the permalink.